Very nice and clear, works great, you made my day! 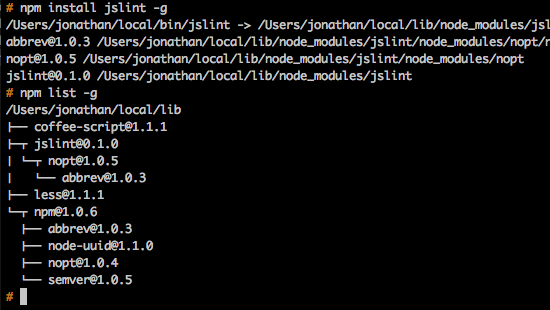 which runs jslint, only display your first error in the command line. (1 of 3): Missing semicolon. I have a problem though. Jslint works well, but I don’t see error message. I can see it only if I run “:copen”. Why “:cw” doesn’t work for me? #1 Expected ‘;’ and instead saw ‘b’. #2 ‘b’ was used before it was defined. All I can think of while reading your reply is that you might not have the right version of “jslint” installed. Or that something might be interfering with your setup … you might want to trim your vim config files to a minimum and see if you get the same behavior. Looks like the error format changed. For v0.1.4 this worked. That one will match after ten errors because it adds another space in front of the pound sign. Thanks man. You are a true webmaster.